Not posted much lately as I have been busy working on Breens Crossing(now abandoned) where the road crosses a narrow gauge mining track which is still in use(just).Will post more pictures later. 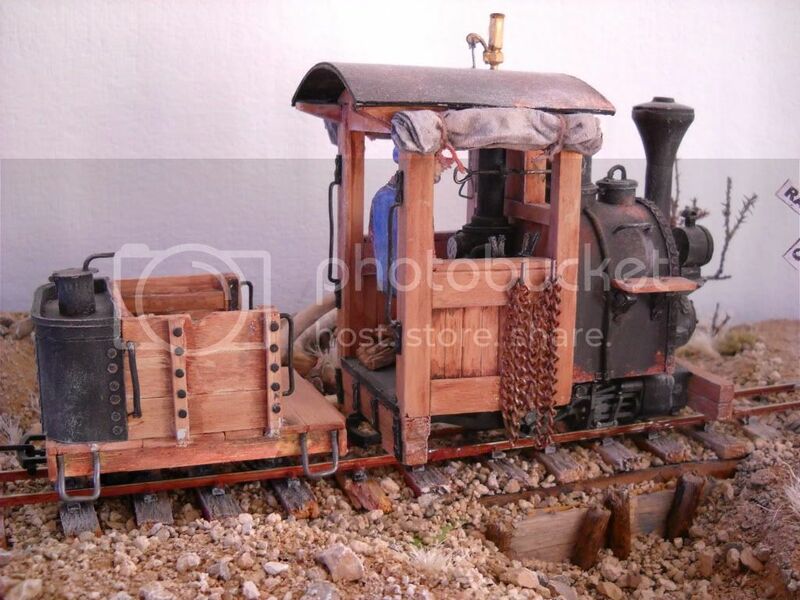 They may be needing that snow plow to push something heavier than tumbleweeds off the track before too long. I've no idea why you should abandon this project Robin? - It looks pretty good to me - quite original [to my mind] and very characterful. It's certainly a good job by my book. Wow!! Absolutely stunning. The little scene has loads of character. Well Done. I really love it . It's plenty of charm and a little derelict. OK. Looking at your signature, can we assume this is built from card? If so, we'll need a sbs, pleeeze, 'cause more card techniques are always welcome. You have captured the weathered and 'abandoned' look very well. I like the way you have put the rails up on plates which gives it a more spindly look. A "Step By Step"!!.............. Don't worry - I had to ask about that one - t'was new to me as well. Robin - I see now [phew] I just read it wrong in my head - I hope I wasn't the only one to do that if only because I don't want to feel a twit on my own! Your follow-up pictures do nothing but confirm my initial thoughts though. ........... What a fantastic job you've done, I noticed the raised rails too - and also thought it worked very well. In request for an sbs(step by step) this is the only way I can describe building Breens Crossing.The store is a box approx.22cm x9.5cm(which held 12 foil cat food pouches,I have 4 ,cats mean) the cover planking is cereal box sides ,painted and cut into 10mm wide strips(to allow for a 2mm overlap).Window,door and end framing is 2 or 3,5mm strips stuck together(2 or 3 ply).The track is Peco streamline flexi track,glued and pined through the rail holders onto wooden sleepers (these being 55mm x 4mm in size),the wood used for these was reclaimed from an old larch lap panel fence I had to replace.The locos are also made from cereal packets with oddments of wire ,lollypop sticks and vinegar bottle tops for the top of the funnels,The large signs on the store are hand painted the remainder being from Laurie Greens web site(which I don't seem to be able to find again).I think this covers pretty well everything if not just ask. Wow, this is an Excellent display and a Great job on the locos. I would like to see a picture of the overall scene. What material did you use for the ground cover? I could be wrong, but I dont think Robin comes here much, if at all these days. 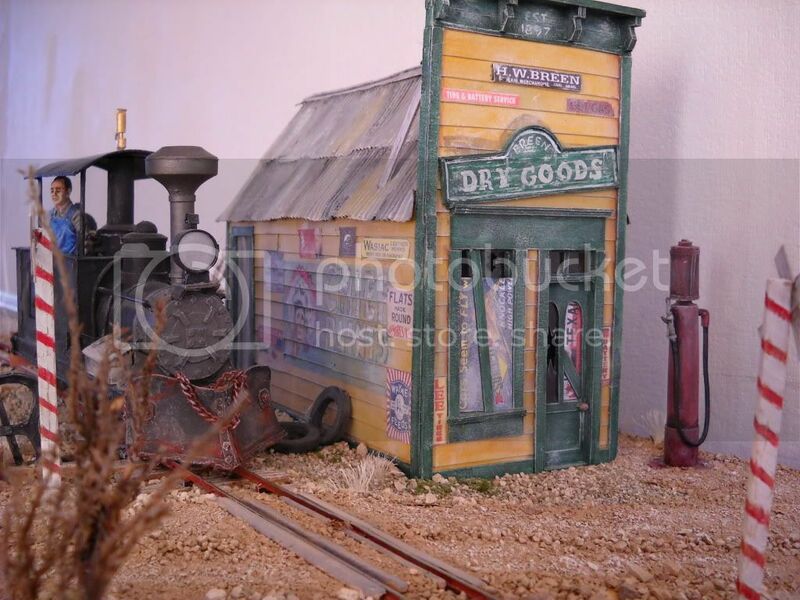 I suspect that what you see in the photo's is all there is to this diorama and it is based on one built by Joe Crea who chronicled it's construction in the GAZETTE (NG&SL variety) probably 10 to 15 years ago. Perhaps someone with a better memory than me can remember the name of the original, or has an index of NG&SL articles that can add more info? Hi Mike,no more photos I'm afraid,what you see is it .The layout/diorama is 36 inches long by 12 inches wide and the ground cover is "cat litter", a product used in cat toilet trays.Thanks for your kind words. Hi Steve,I have not posted for some time "true" as I can not decide GN 15 or Gnine. as soon as I think I have found a suitable GN 15 subject you come up with another Gnine kit,I am waiting to see what you come up with for the KATO double bogie chassis.As reference to the Joe Crea article I have not seen this as my scene was copied from a photograph a friend took on a visit to the US a long time ago,I will have to now trace that article,thanks for the info. Thanks Robin for the information. Steve, I forgot about the article in the NG&SL Gazette. It is in the Sept/Oct 1985 issue starting on page 42 describing the construction of the Jefferson Dry Goods. 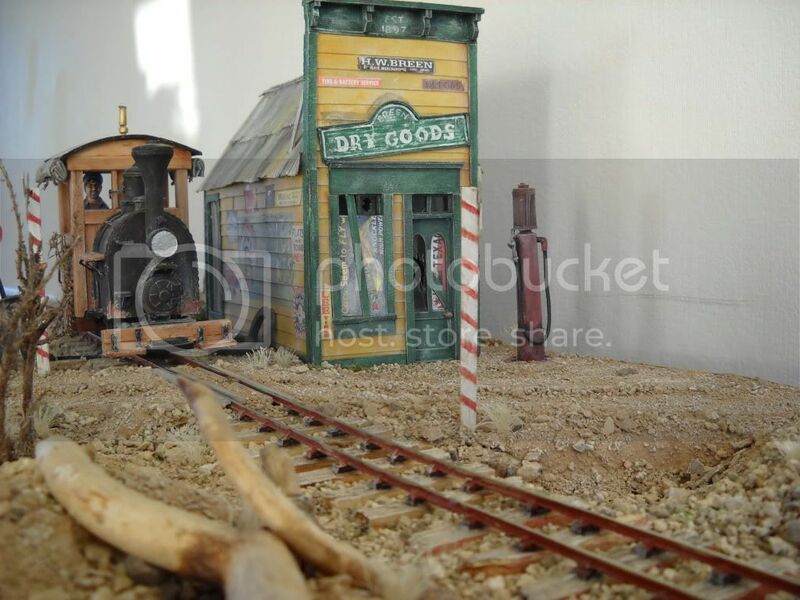 This was an article in a series by Joe Crea describing the 1/2 inch scale Colorado & Southern diorama. There were also articles in the Jan/Feb 1985 and May/June 1985 issues about the Colorado and Southern Mogul and rolling stock. 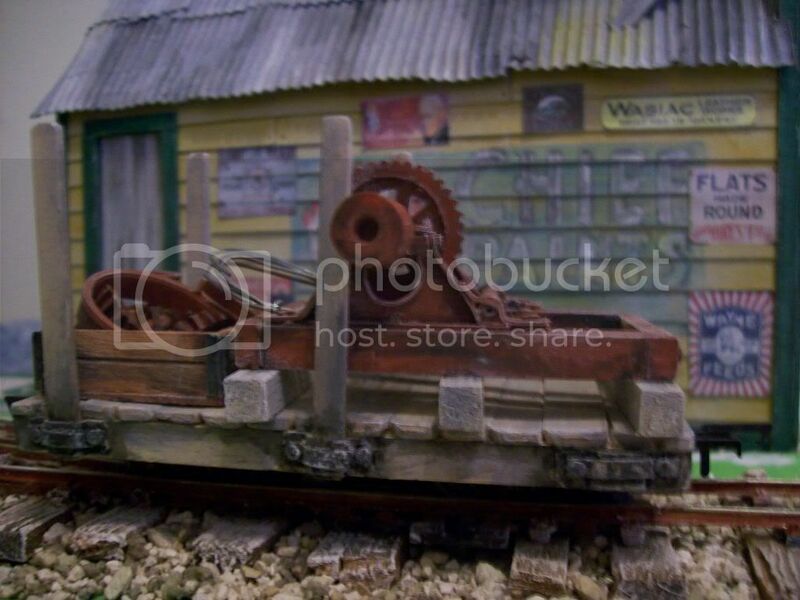 Looking at the pictures of this diorama it looks like the track layout is just straight track with one right hand switch beside the building. 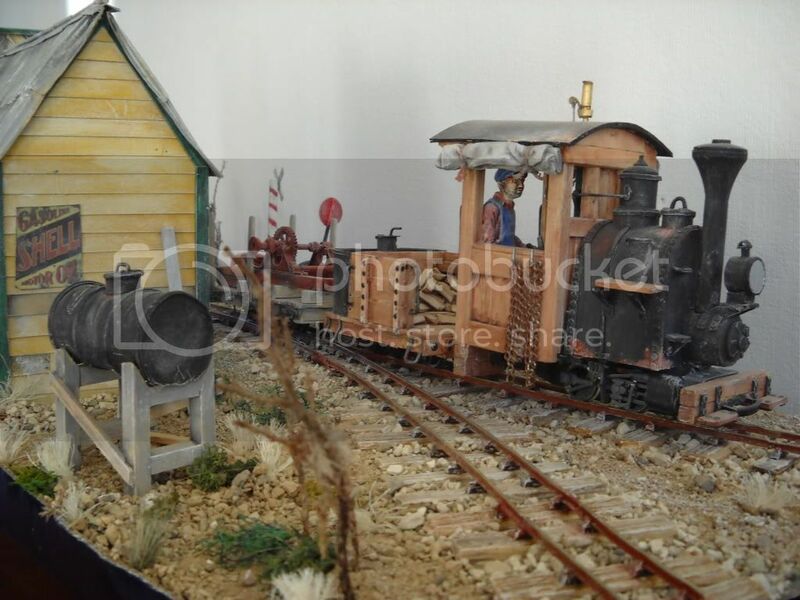 Is this the same track layout that was used on Joe Crea's layout? It doesn't show in the NG&SL Gazette. Yes my diorama has one track with a short spur siding,on the photographs I saw Joe Crea's diorama has two tracks.I was told that these photographs had been taken at an National Narrow Gauge Convention which my friend attended whilst on holiday in the US.I had sent for a back issue of the magazine you mention,but you now say no tracks are shown. The track plan is not shown but there is a plan showing the benchwork and a description about how it was constructed. It does look like in the pictures that there are two parallel tracks and a stub switch with a switch stand beside the building. There are excellent 1/4" scale drawings of the Jefferson Dry Goods Building. This is an excellent article with very good photos, I think you will be pleased with the back issue. Cheers for that Mike can't wait for it to arrive. 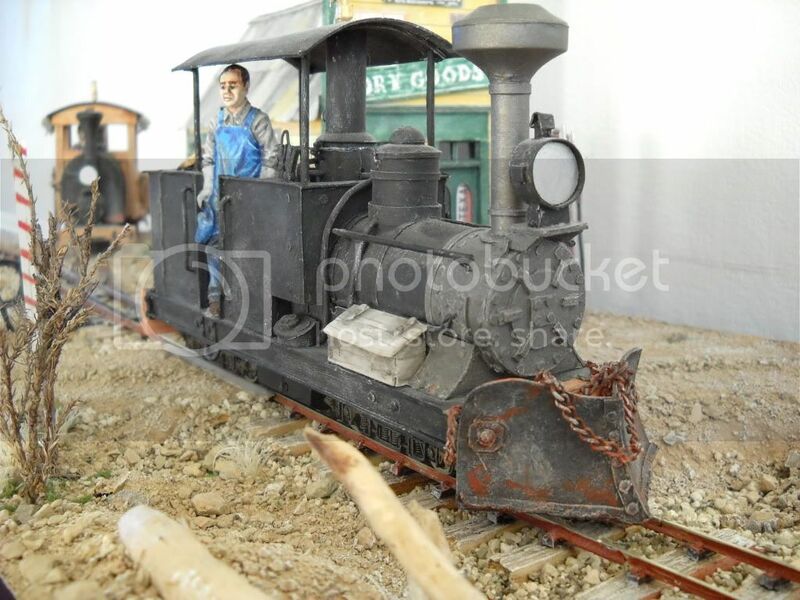 This is the kind of highly detailed modelling that inspires us all to do just that little bit beter. And you know what? Despite the fact there are rivets aplenty here . . . Who's counting!